Melodies coming from the three brass instruments punctuate Los Angeles Ale Works’ WWII-era warehouse, situated in an industrial stretch of Hawthorne. Two world-class musicians from the Los Angeles Philharmonic, Christopher Still, second trumpet, and David Rejano Cantero, principal trombone, are literally dressed for the occasion: tuxedos with tails and rubber boots. 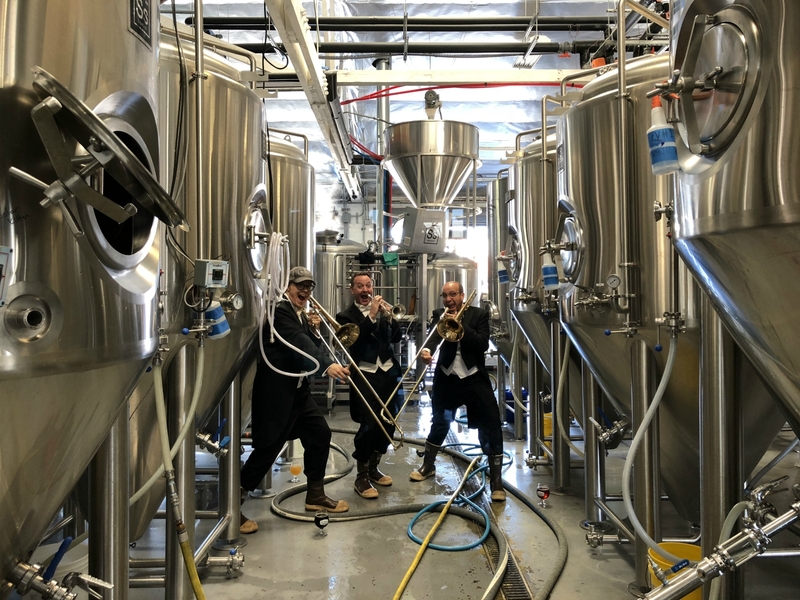 They are joined by Kristofor “Kip” Barnes, L.A. Ale Works’ co-founder and a former member of the USC Trojan marching band, as they serenade L.A. Ale Works’ fermenter while it brews L.A. Phil 100 Brut IPA. 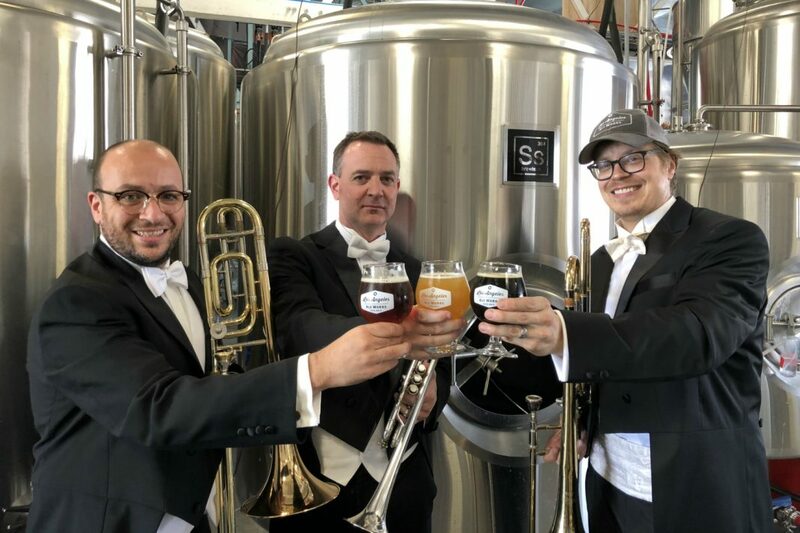 The specially crafted beer honors the Philharmonic’s centennial and will only be available during the 2018-2019 season. This brew day was in mid-July, three months before the L.A. Phil began celebrating its centennial season, which runs from September 2018 through October 2019. Despite the day having started before sunrise, the three musicians and craft beer aficionados effortlessly belted out “Ein Prosit” (a wildly popular Oktoberfest song) among other brass-oriented pieces. The initial conversation about a centennial beer started years ago among a few of the Phil’s musicians (who, like Still, were home brewers) and Frances Lopez, executive director of the nonprofit Los Angeles County Brewers Guild, during a Casual Friday series at the Walt Disney Concert Hall. The Casual Friday series and CODA (a play on the classical music term for the concluding movement or the coming of the end of the piece) were designed to attract a younger (20s and 30s) and more culturally diverse audience to the L.A. Philharmonic. The two initiatives focus on introducing young professionals and music enthusiasts to orchestral music vis-à-vis discounted tickets to shorter concerts accompanied by after-parties complete with cocktails and hors-d’oeuvres set in an intimate atmosphere that encourages conversation between guests and L.A. Phil musicians. “We’re trying to break down that stereotype that L.A. Phil concerts are only for a certain part of our society. It’s really for everybody,” says Still, who joined the Philharmonic in the 2007 season. He observed how the craft beer scene is doing the same thing by encouraging people to try new brews and be receptive to varied methods of brewing. “The biggest misconception about orchestral music is that you have to be super educated and know a lot about music and have a certain level of income to enjoy a place like the Walt Disney Concert Hall,” Still explains, stressing that it couldn’t be further from the truth. 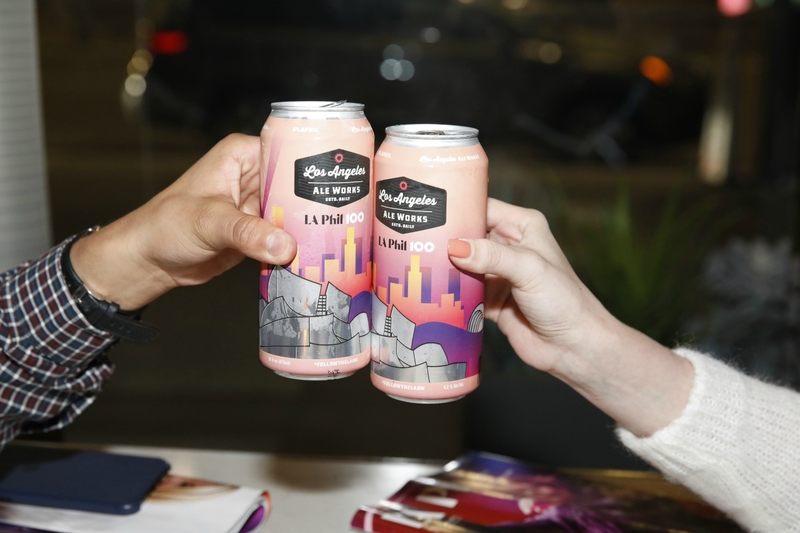 The same demographics turning out for the informal programming (particularly Millennials) were also patronizing L.A.’s slew of craft breweries. Lopez, who previously led marketing and sponsorship efforts for then-independent Golden Road Brewing Co., began laying the foundation and building the relationship between the Phil and the region’s independent craft beer community back in 2015. Through a partnership between the Guild and the Phil, a revolving lineup of local craft beers became available at Phil events at both the Hollywood Bowl and Disney Concert Hall. “Every year [since 2015] we were able to increase the number of events the Guild was partnering with the Phil,” said Lopez who noted that event participation isn’t just focused on showcasing one specific brewery but, rather, multiple breweries and the Guild itself. “Unique to our partnership [between the L.A. County Brewers Guild and the Phil] is the fact that the Guild not only wants to promote craft beer but we also want to promote Los Angeles,” Lopez continued. L.A. Ale Works, which was among the local breweries featured during the Phil’s Casual Friday series, was tapped to create the Phil’s centennial-themed beer for a number of reasons, from the flexibility in their brewing schedule to the artwork on their beer cans. The brewery was given a narrow window for crafting a beer to coincide with the Phil’s California Soul Gala, which took place at the end of September, and which ushered in the start of the centennial season. “It was literally a matter of weeks between the day we donated beer to L.A. Phil’s Casual Friday in early July, to the discussion we had with their marketing team, to bringing in Chris and David on brew day, and working with the Phil on designing the artwork for the beer,” said Andrew Fowler, L.A. Ale Works’ other cofounder. A relatively new iteration of the IPA, brut IPA is much drier and lacks the bitter, lingering hoppy aftertaste typical to traditional West Coast IPAs. The name is also a nod to the black-tie attire relationship between champagne and classical music, and the beer’s similarity in appearance and fragrance to its bubbly cousin. Stills even gave a solo trumpet performance during brew day to honor the “Brut” name, playing “Coconut Champagne,” a piece written by Denis DiBlasio. As Barnes explains, the addition of the enzyme amylase glucosidase “converts the complex sugars into fully fermentable sugars whose end result is a super-dry beer that is sub gravity and not bitter.” While the rest of the brewing process is similar to any other beer, Barnes points out that with a brut IPA “no hops are added to the boil or whirlpool because you want the complete fermentation process before adding in hops.” By incorporating extra puffed jasmine rice, the beer becomes much drier and lighter but doesn’t sacrifice its flavor or body. Brewing L.A. Phil 100 Brut IPA with Centennial hops (piney and resin in flavor with elements of citrus), Wakatu hops from New Zealand (a lime zest and earthy citrus flavor profile), and fresh zested orange peel was an homage to the heritage of aromas native to Los Angeles when the Philharmonic made its debut performance in October 1919 under the orchestral direction of Walter Henry Rothwell. It was a period in Los Angeles County when citrus groves and fruit orchards dominated sprawling agricultural fields marked with farms and even vineyards; when Angelenos’ transportation included streetcars, interurban railcars, and automobiles of the day; and when the motion picture and aviation industries began to establish themselves in a region now synonymous with their influence. The Phil too has evolved over the last 100 years, becoming increasingly innovative and forging deep ties to the community. Its hallmark youth program, Youth Orchestra Los Angeles (YOLA), inspired by Gustavo Dudamel’s musical upbringing in Venezuela’s El Sistema, makes music education accessible to L.A.’s low-income youth. And, in an effort to ensure accessibility of world-class orchestral music in Los Angeles, the Phil puts on free concerts in underrepresented neighborhoods across the city. As the Phil celebrates its centennial, a new epoch begins. And that’s worth a toast with a really good beer.